The HEKA Turbo 90/S is the perfect complement to the HEKA Turbo 84, 126 and 168 models. Having the same overall dimensions, this hatcher can be easily placed on top of the setter incubator. Naturally, however, the Turbo 90/S can also be set individually as a hatcher to supplement any incubator. This way you gain flexibility by allowing the continuous reloading of hatching eggs without having to use a permanent temperature and humidity setting in your incubator. The casing is made from hygienic synthetic material for easy cleaning, particularly important for the hatch of your chicks. 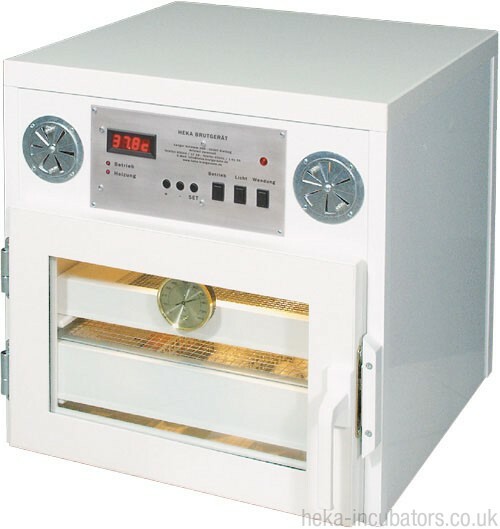 Below we explain the quality and standard equipment of this incubator. There is provision in your order to state if you would like to connect the appliance straight to the water supply, this will be fitted by us at no additional cost. All breeding machines in the HEKA Turbo series are equipped with double glazing. The insulation value is much better in comparison with single glazing, and uses less energy. Also, insulated glazing does not begin to steam up until higher than ~80% humidity, and higher values are not normally required. Wooden baskets feature a favourable price because they are made of moisture-resistant (sauna)wood. These baskets last for very many years with perfect stability and without becoming deformed. The plastic baskets offer in addition the advantage of a hygienic easy-to-clean surface, of particular importance wchicken our hatchers are used in laboratories and research facilities, but also important for brooders, who are keen on cleanliness. The hatcher is completely equipped with all the accessories, which are needed. Included is the interior lighting of the hatcher, two hatching-baskets of your choice, a hygrometer, a three partition water basin and a detailed manual.